In this original study, David Forgacs re-examines the film and its place in Rossellini's career. 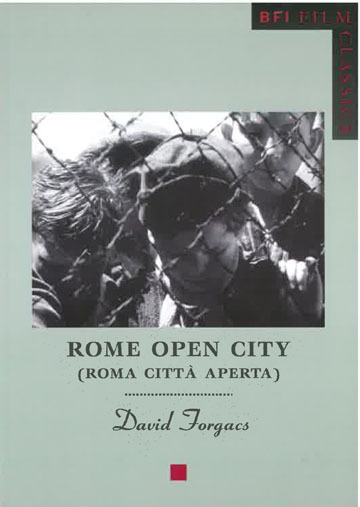 Otto Preminger said the history of the cinema was divided into two eras: one before and one after Rome Open City. Made in 1945, the film is based on events which took place in Rome just one year before, during the Nazi occupation and the resistance. It made a huge impact on its release, launched the international reputation of its director, Roberto Rossellini, and came to be seen as the founding work of Italian neo-realism. In this original study, David Forgacs re-examines the film and its place in Rossellini's career. He reconstructs its production history, its relationship to the events which inspired it and the time in which it was made. He argues that the film has great value as a commemoration and a documentary record even as it rhetorically reshapes events, people and places into patriotic myth.